Your dating website members will likely be uploading a lot of photos, video and audio files, exchanging messages and posting comments on the site. You can’t be 100% sure of intentions or adequacy of those whom you do not personally know. Moderation tools can help you to filter out unwanted or inappropriate content. Whenever something requires your attention, you will see the moderation wall appear on the admin homepage. The list of the wall objects may include user profiles, uploaded photos, audio and video files, offline payments, abuse reports, and more. This feature is meant to give you fast access to moderation and keep everything in one place. 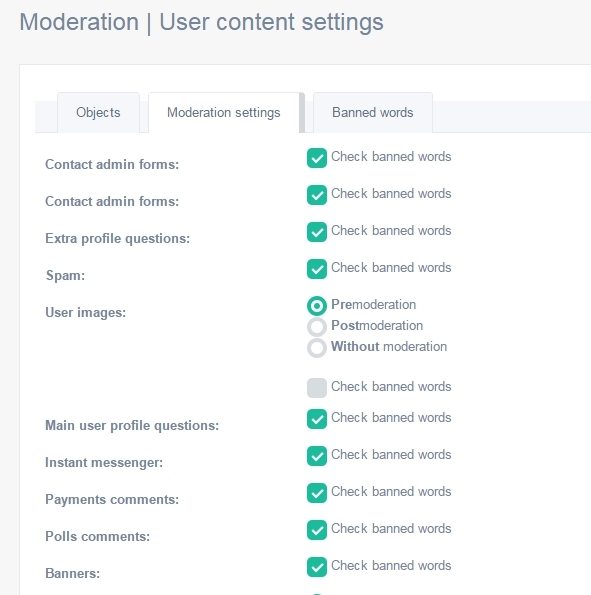 You can also proceed to review the user generated content in the Moderation section of your admin panel (/admin/moderation). You can set uploads to be PREmoderated, POSTmoderated or activated without any moderation. PREmoderation means all uploads should be approved by administrator or moderator before they become active and visible on the site. If POSTmoderation is used, they become active without moderation, but they may be deactivated later by administrator if required. You can also switch on Check banned words option for all the texts people write themselves. In this section administrator is able to list words which are not allowed on the website. The system will find them in the personal texts if Check banned words option is switched on in the Settings.